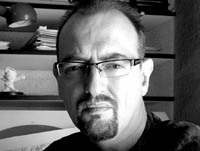 Born in Barcelona in 1964, Sergi has been involved in the world of illustration since 1981 when, at the age of seventeen, he began working as animator and illustrator in an advertising agency in Barcelona. After working in various studios and several publishers, in 1989 he started his own company, Studio Camara, where he has since worked as a animated cartoons producer, creator, animator, writer and director, as well as developing several projects in the editorial world as an author - illustrator. , a series of short films that he created and directed. This commercially successful series has been shown in more than 130 countries on some of the most well-know television channels in the world: Fox Family Channel (USA), TV Azteca (Mexico), Disney Channel (Italy), Time Warner (Latin America), Taurus Film GMBH & Co (Germany), and Teletoon (France and Canada), among others. His Children's Books and Art Instruction Books have been translated into over 7 languages and marketed by various publishers in Spain, USA, England, Portugal, Germany, China, France, etc. Today he continues to develop new animation projects while writing and illustrating children's stories. For original written works by Sergi available for review, please contact us. Listing of Awards - coming soon!